Forty years ago this month the British public got their first glimpse of a computer system so advanced that it put everything else to shame. Invented by a brilliant computer scientist called Ensor, Orac was a sophisticated artificial intelligence system which was adept at both speech synthesis and speech recognition, could control any other computer, and it all came in handily transportable transparent box. You might think that this sounded a bit more complex than (say) a contemporary RM 380Z, and you would be right. 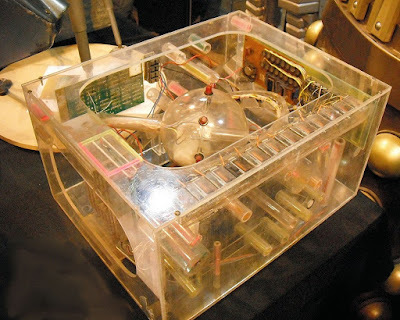 Orac was in fact a fictional computer from the cult BBC TV Show Blake’s 7, and was clearly just a Perspex box with some flashing lights and odds and ends inside it. Debuting in the final episode of the first series, Orac became a key member of the cast. Short tempered, irascible and often unpleasant to deal with, Orac was probably marginally nicer to use that Windows 8. But not much. Blake’s 7 itself was a low budget but thoughtful space opera, featuring a dysfunctional group of resistance fighters battling against a powerful and corrupt Federation, using a salvaged alien spaceship with a grumpy computer of its very own – by the name of Zen. Inspired by the show and the advanced but oddly uncooperative technology, the names “Orac” and “Zen” were adopted by a generation of computer scientists who would apply these liberally to computer systems of the time. These days of course voice-controlled and somewhat unhelpful computer systems are commonplace, but in 1978 they seemed to be very futuristic. Just not a future many of us would like to be living in. The closest modern equivalent to Orac might be the Amazon Echo, however for a bit more you could buy yourself a Baby Orac replica instead… and although it might not do as much, it is probably much cooler.